First of all, I have to say this article was first published in the ITI Bulletin (http://www.iti.org.uk) but as I realise not all of my readers are currently subscribed – you should! Do it here and click on ITI Bulletin on the left-hand side list – I thought it would be interesting to repost it – with some special thanks and a few links the original did not have. Enjoy! This article is intended to be a helping hand for those who are new to this profession, but also for those who are planning to ‘revamp’ their computing gear and tools and don’t know where to start. This is what I use and love, and to cut a long story short, it’s all Apple. When I started as a freelancer, I have to admit it: I was a PC user. Simply because I already had a PC that underwent the transition from uni/leisure/MSN laptop to work/serious/professional laptop overnight. Yes, really. And honestly: before 2006 I had never even seen a Mac with my own eyes. Too edgy, too American, and sort of untouchable, at least back in Italy. Back in 2005, I spent a fortune on a 30GB iPod Classic and I loved it. In the UK, I was one of too many iPod owners. But back home, I was a HERO. When I started freelancing full time, I was younger (a little bit, at least) and didn’t even have a proper desk. No desk = no chair = no frills. So, my laptop at the time (a 10in Panasonic Toughbook) was perfect in this sense: lightweight, highly portable and, I have to say, quite reliable. Windows crashing and freezing apart, I managed to write an entire 180-page MA dissertation on that, while my supposedly trusted, brand new 17in HP Pavilion gave me the blue screen of death after six months and had me panicking for a few terrible hours. (Thank goodness for consumerism and for my second, apparently unnecessary, spare Panasonic). In the end, my birthday came along and considering that my HP’s blue screen episode was definitely NOT one of my finest hours, my dad (bless him!) bought me a MacBook Pro. Not even a regular white MacBook, a 15in MacBook Pro! I was over the moon. The only detail was that, ahem… I didn’t even know how to type ‘@’ on the shiny new keyboard. So thank you Fabio Benedetti (find him on Twitter at @artscode ) for being a smart Mac user and teaching me a few tricks to start with. 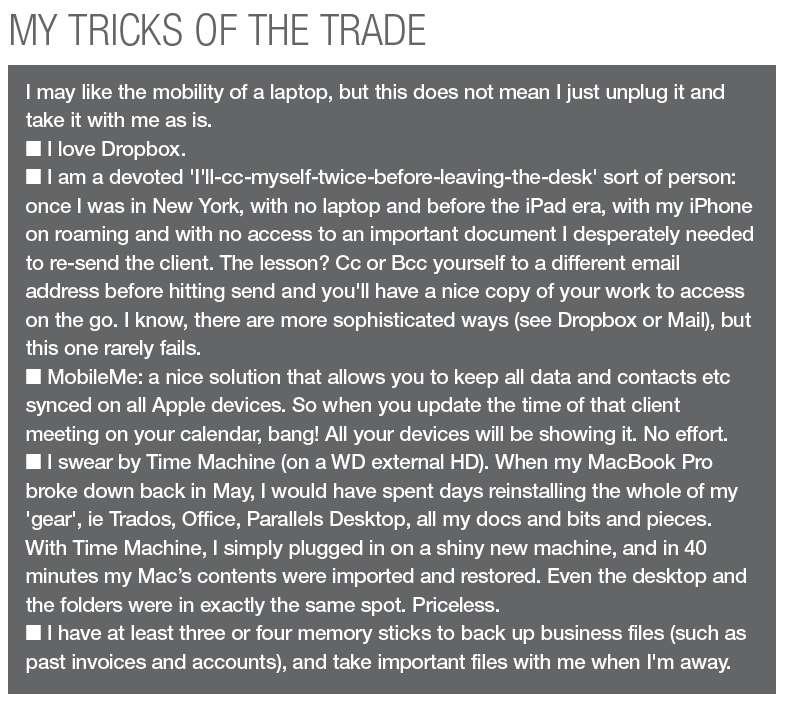 In any case, having a soft spot for technology and gadgets, it didn’t take me long to work my way around the Mac and start using it for business. As my work volume grew, I realised this big, powerful machine came in very handy. Being a heavy user (to quote the Apple Store employee who told me my beloved Mac’s hard drive ‘endured a hard life’ with me, as a massive 11hrs+/day user), I now have a new generation MacBook Pro. I would still say the MacBook is great (even though, sadly, the iconic white one is being discontinued) but, with a 2 GHz Intel Core i7 processor and 4GB (expandable to 8GB) memory, the Pro is definitely the best value for your money (currently retailing at £1,600). I also have a MacBook Air. I have to admit it has its limits (it tends not to like being overloaded too much, has no CD slot, has only one USB port and its memory cannot be expanded further than 2GB) but hey ho, it’s so light you forget you have it in your bag. And mine is the old model! The new one (11in) is even more practical and lightweight. Adorable. The ideal way to have the Mac experience with half the size and the impediment, although I do not recommend it for long periods away or if you are overloaded with work. I run Parallels on it and it works fine, but I would not suggest keeping too many files on the machine. If I know I’ll be away for more than four or five days and I have 30k words to finish on Trados or MemoQ, I’ll take the biggie. Note: the new model is more powerful and the few glitches my first-generation Air has got have been sorted out nicely. As soon as it came out, I was bewitched. 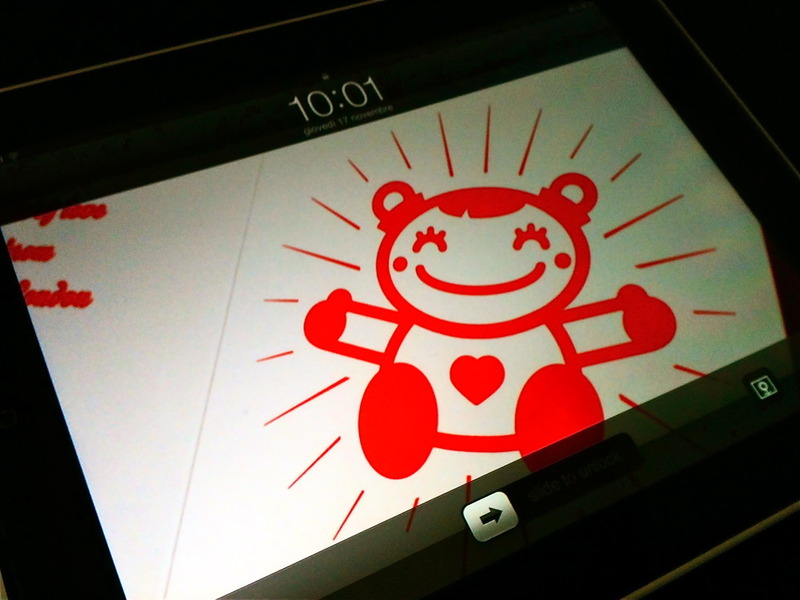 The iPad is a lovely, lightweight thing that had me at first glance. I have used it for slide shows, presentations, document drafting and sending, and reading on Kindle for iPad. It’s great for showing your price lists or your company profile to clients without waiting for a laptop. The battery is very long lasting. Not to mention the wow effect. Downsides? Yes, some – at least as far as the first-generation iPad is concerned: no USB, no camera (the iPad 2 has one), no CD-ROM or the like. It simply isn’t a laptop, and cannot replace a Notebook. And it shouldn’t, in my opinion. But if you’re going out for the day (I do it every week), going to a meeting or business lunch, or even planning to be out and about for a few hours with no business in mind, rest assured that all of a sudden you’ll need to send a short sentence to that good client of yours or check a file that the client is not sure of. It happens to me all the time… The iPad weighs next to nothing, and with a 3G or WiFi connection it takes no time at all to get online. I agree this device is a plus rather than a must-have, but if you have money to invest, think about it. (After business hours, it’s also great for watching TV via the BBC or ITV players). a desktop, but it does not work as a standalone machine unless connected to my laptop. This gives me a big picture (literally) and is useful because, even though I do not wear glasses, my eyesight deteriorated slightly this year. Plus, comparing documents on a 23in screen is just so nice. So I’ve got the size while still being able to unplug quickly and be ready to go, without having to transfer any documents. Personally, I will never, ever, under any circumstances, willingly go back to a PC. I am sorry, but I don’t believe the compatibility issues (never had any. Most clients don’t even know I’m a sole-Mac user); the price tag doesn’t scare me, as I’m sure you can save on other useless stuff and make your money go the extra mile; I believe quality must be paid for; I don’t swallow the old ‘I am so used to PCs I won’t have time to learn’ excuse. Nonsense. Your body (and mind) is made to adapt. In short: reliable, intuitive, virus-free, spot-on support, and their shiny, classy look is easy on the eye too. Special thanks: To ITI, Nick Rosenthal and Rachel Malcolm, for liking my articles! Along with the many ITI colleagues who enjoyed reading me. You’re great. Kudos as well for colleague Rose Newell who inspired me with her post along with Philippa Hammond’s, who also wrote on geekery, PCs and Macs.